Geneva was born in Commerce, Missouri, a Mississippi river town that merited its name in the steamship era. The family moved up to St. Louis when she was two, and she grew up in the Central West End. G was graduated from Marquette School and then attended Central High : destroyed in the tornado of 1927. Although that meant commuting to another school, her class apparently retained its identity. G was already recognized for her art in high school. Her yearbook entry reads, "In Central they are an essential part - Geneva Abbott and her art." She was selected to make a drawing for the yearbook of what St. Louis would be in future; see the Psychic Artist section below! After being graduated from Central in the January Class of 1933 - early, at 16 - she studied Commercial Art at Hadley Vocational School for two and a half years ("one of the finest, most elaborate, and most luxurious vocational schools for whites," recalls Judge Theodore McMillian). She took evening classes in Fine Arts at Washington University. She then worked nine years in commercial art and advertising for the International Shoe Company. Geneva and her two sisters attended Giddings-Boyle Presbyterian Church, and G was active in the youth group, responsible for putting out the weekly church bulleting. That is where she met Donald Patterson, whom she wed in 1939. 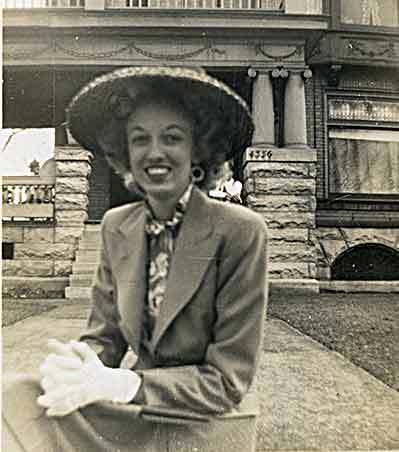 Geneva became active in the Society of Independent Artists of St. Louis while she worked to qualify for the Artists' Section of the St. Louis Artists' Guild, which she was invited to join in 1957. After leaving International Shoe, Geneva had turned her efforts entirely to fine arts. G was a valued officer of the clubs and societies she joined; she kept good minutes, good accounts, and ran meetings according to Roberts' Rules of Order in a very businesslike way. She always showed initiative in fostering new art events, to give more artists the opportunity to show, and to involve the community, and to encourage high standards in art. While she worked hard for many art fairs, juried shows were her personal preference. She organized and served as juror on outdoor art exhibitions, and was active with the Ruth Kelso Renfrow Club, the Monday Club, and the Craft Alliance Gallery. Geneva was always an active artist, interested in experimentation and in expanding her range of skills and techniques. 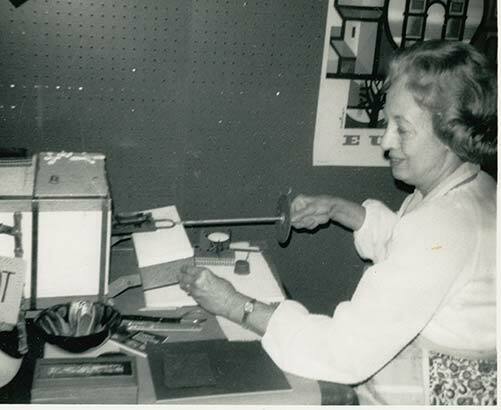 She participated in many professional workshops, such as: enameling, with Kenneth Bates in Gatlinburg; watercolor with George Post at Mendocino, with Tony Couch in Georgia, and with Millard Sheets, Jade Fon, and Jane Burnham at Asilomar. She studied oil painting under Val Vogel, enameling with Dorothy Farley, and portraiture with Fred Carpenter and with Virginia Schlueter. One of the ways Geneva contributed to her community was to offer portrait sketches at school and church fairs. Many parents were delighted to get a charming portrait at the very modest cost these fund-raisers asked for. She also offered occasional art workshops and demonstrations to schools, children's camps, and scouting groups. For many years, G and Don enjoyed the annual costume ball held by the Society of Independent Artists, always booking a table or more with non-artist friends who liked to join in the fun at the Chase. G and her husband Don both loved to travel, and took several trips each year, providing scenes and inspiration for many paintings. They were also avid bridge players, and participated in many duplicate bridge tournaments. A life master, Geneva sometimes held the highest rank in her state. Geneva and Don relocated to Hilton Head Island in 1980 when he retired. 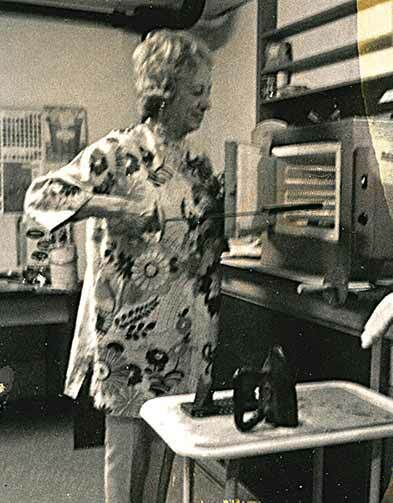 There, she served on the board of the Hilton Head Art League and was president of the Friends of the Library. She got art exhibits started at the library and continued to be the organizer for many years. She participated yearly in the island's charity auction Evening of the Arts, and was a member of the Beaufort Art Association and the Sea Pines Community Center. On Hilton Head, she held a solo and a two-artist exhibition, and showed annually with the Low Country Artists. Geneva attended Spring Made Beach watercolor workshops as well as workshops on the island. While in St. Louis, GG's work was accepted into all the juried exhibitions she entered, but once in SC, most of the exhibitions were non-competitive. She did, however, receive many commissions which kept her as active for private clients as she was for the group shows. In 2002, Geneva and Don moved to Vero Beach, Florida. The move from Hilton Head took quite a toll on Geneva, who had wanted to pack up her own studio. After arriving in Vero, she suffered from shingles for months. She was never up to joining the artist commununity in Florida, and had no studio to work in. During summer visits to Pat in Virginia, Geneva could make use of a studio set up, and produced some more watercolors, a few small oils, and some sketches. Then, having broken her hip in the early hours of her 93rd birthday, Geneva agreed after being discharged from rehab to return to Virginia with Pat. Don followed in May, and the move became permanent. G did not show art in Virginia, but some of her paintings have been sold to people who have viewed them at Heaven Scent B&B. Geneva's works are in many private collections - and anyone who can supply a photograph of her work, for this site, is asked to do so. 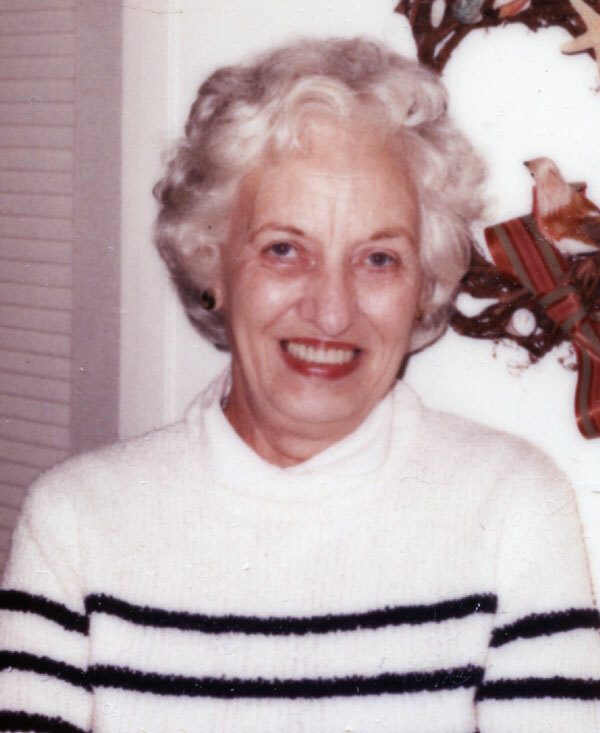 Geneva passed away peacefully at home with Pat and Don on March 19, 2011, a month after her 95th birthday. Don lived on (with Pat) to July 2012; Don and G had celebrated 71 years of marriage together. Pat Patterson's own collection, along with what remains from what G gave her to sell at the bed and breakfast. Shown as well as possible from old photographs, which exist for too few paintings. G's art is in collections across the US as well as in Japan, Italy, and who knows where. Would love to have photos of works not shown here. Many of these are notecards G had made; others are originals from sketchbooks. There are more to be scanned. A little liberty taken in what's called a portrait. Geneva produced hundreds of portraits, mostly of schoolchildren, but no photos were kept. Would love to have a photo from anyone who can provide one. Many of Geneva's enamels sold, as she exhibited regularly in a local gallery; but many were lost as well when that gallery folded without returning (or paying for) her work left there. Ron Patterson has a collection of which only a few pieces are seen here. Enamel on copper "Minor Prophets", watercolor-collage "Pink Floral", and watercolors "Basket of Orchids" and "Entry" sold to R. Wolfe. Donated watercolor "French Sentinel" to An Evening of the Arts: 18th Annual Art Auction, Hilton Head. Sold for $325. Exhibited watercolors "Near Carefree" and "Flower Stop" at the Fraser Gallery, Sea Pines SCA Building. Exhibited watercolors "10th Century Tower, La Napoule, France" and "Riverside" at the Fraser Gallery, Sea Pines SCA Building. Exhibited watercolor "Colorado Trail" 18 x 26. Exhibited watercolor-collage "Rock Garden" and watercolor "Flower Stop". Exhibited watercolor "Greenbriar Garden" (22 x 26). Exhibited watercolor "Entry" (21 x 25) (sold to R. Wolfe). Donated watercolor "San Francisco Morning" to An Evening of the Arts: 18th Annual Art Auction, Hilton Head. Sale detail lost. Exhibited watercolors "No Fare" and "Southern Comfort", which sold in March and was replaced by "Entry" at the Fraser Gallery, Sea Pines SCA Building. Exhibited oil painting "Forest Preserve". Started out in Juan-les-Pins, ended up in Paris. A trip that inspired many works of art! Exhibited watercolor-collage "Rock Garden" and watercolor "Entry" at the Fraser Gallery, Sea Pines SCA Building. Exhibited watercolor "Spring in Beaufort". Invited friends Betty & Conway Kuhlmann to join on this timeshare-exchange vacay. G took an air balloon ride! Exhibited watercolor "Sunlit Marsh" (20 x 24). Exhibited oil paintings "Temptation" and "Pair of Pears" at Sea Pines Gallery. Donated watercolor-collage "Old Country" to An Evening of the Arts: 18th Annual Art Auction, Hilton Head. Sold for $550. Exhibited watercolor "Seaside" and watercolor-collage "Birds, Bees and Blossoms" at the Fraser Gallery, Sea Pines SCA Building. Exhibited watercolor "San Francisco Morning" at the Self Family Art Center. Exhibited oil on canvas "Spring in the Forest" at Sea Pines Gallery. Exhibited oil "Sea Pines ", which sold during the show. Exhibited watercolor "Back to the Barn" (18 x 24). Exhibited oil paintings "Flower Market" (sold during show) and "Garden Shop " at Sea Pines Gallery. Exhibited oil "Wildflowers" at Sea Pines Gallery. Sold during the show. Replaced Jul 11 with oil "Land's End" which also sold. Exhibited watercolor "Dockside " at Sea Pines Gallery. Displayed watercolor-collage "Birds, Bees and Flowers"Presented by the Hilton Head Art League at Windmill Yacht Club. Exhibited watercolors "Boardwalk" and "Sunday Afternoon". Exhibited watercolors "Surf" and "Sunlit Marsh" at the Fraser Gallery, Sea Pines SCA Building. Exhibited watercolor "Floral" (18 x 24). Exhibited watercolor "Southwestern" at Sea Pines Gallery. Norwegian Cruise Lines from Fort Lauderdale. Went with friends Betty & Conway Kuhlmann, staying with them pre- and post-cruise. Exhibited watercolor "Cliff Hanger" at Sea Pines Gallery. Donated watercolor "Siena Scenery" to An Evening of the Arts: 17th Annual Art Auction, Hilton Head. Sold for $870. Exhibited watercolor "Lapin Agile" at Sea Pines Gallery. Exhibited mixed media piece "Fantasia", and watercolor "Marsh Scene", which sold and was replace with watercolor "Local Color" at the Fraser Gallery, Sea Pines SCA Building. Exhibited watercolor "Sunlit Marsh" at the Self Family Arts Center. Exhibited watercolor "Local Color" at Sea Pines Gallery. Exhibited oil "Sweden, Lake Malaren" at Sea Pines Gallery. Exhibited watercolor "Hibiscus" at Sea Pines Gallery. Stayed outside town in a condo with a view, rented a car to see all the area. Exhibited watercolor "Mellow Marsh" at Sea Pines Gallery. Exhibited watercolors "Boardwalk II" and "The Garden Gate" at the Fraser Gallery, Sea Pines SCA Building. Exhibited "Greenery" at the Hilton Head Library. Exhibited watercolor "Southern Exposure" at Sea Pines Gallery. Sold during the show. Exhibited watercolor "Marsh Scene" at Sea Pines Gallery. Or nearly! Stops in Yemen, Jordan, Mumbai, Phuket. Flew home from Singapore. Exhibited watercolor "Bit of Low Country" at Sea Pines Gallery. Donated mixed media piece "Geishas" to An Evening of the Arts: 18th Annual Art Auction, Hilton Head. Purchaser: Clinton Laurer. Exhibited watercolors "Wish You Were Here" and "Southern Exposure" at the Fraser Gallery, Sea Pines SCA Building. Exhibited watercolor "The Garden Gate" at Sea Pines Gallery. Exhibited watercolor "Azalea Time" at Sea Pines Gallery. Watercolor "Floral" sold this month from gallery stock. Exhibited oil "Country Road" at Sea Pines Gallery. Exhibited watercolor "Park Site" at Sea Pines Gallery. Exhibited watercolor "Mixed Bouquet" at Sea Pines Gallery. Exhibited watercolor "Daufuskie Lighthouse" at Sea Pines Gallery. Exhibited watercolors "Floral" and "Boardwalk" at the Fraser Gallery, Sea Pines SCA Building. Exhibited acrylic "Waterway" at Sea Pines Gallery. Exhibited watercolor "Old Town" at Sea Pines Gallery. 17th annual benefit on Hilton Head Island. At the Self Family Arts Center. Geneva contributed her painting "Rare Birds". Purchaser: Zoe Zecchione. Exhibited watercolors "Tybee Island Beach" and "Calibogue", which sold and was then replaced by "Dolphin Head Point". At the Fraser Gallery, Sea Pines SCA Building. Exhibited watercolor "Gulf Retreat" at Sea Pines Gallery. Exhibited her watercolor "Boardwalk" at the Walter Greer Gallery in the Self Family Arts Center. Exhibited watercolors "Bluffton House" and "Boardwalk". Flew into Copenhagen where Pat met G & Don, took them to meet her friends in Viby Sj who gave a party for them to meet their families. Then, the cruise to the Baltic countries and St. Petersburg along with stops in Scandinavia. Exhibited watercolor "Harbor at Antigua" (sold during show) at Sea Pines Gallery. Exhibited watercolor "Floral" at Sea Pines Gallery. Exhibited oil "Life's a Beach" (sold during show) at Sea Pines Gallery. Exhibited watercolors "Over the Garden Wall" (sold to R. Wolfe) and "Balcony Scene" at the Fraser Gallery, Sea Pines SCA Building. Exhibited watercolor "Beach at Cancun" at Sea Pines Gallery. Exhibited watercolor "Dolphin Head Point" at Sea Pines Gallery. Exhibited watercolors "The Catch" (later given to Sue Belle) and "Let's Eat Out" at the Fraser Gallery, Sea Pines SCA Building. Exhibited watercolor "Mountain Trail" at Sea Pines Gallery. Also sold "I-99" from stock that month. 2nd Renaissance Cruise, flying business class to Copenhagen with a stop in Iceland on Icelandic Air. Flew home business class from Stockholm to New York to stop off to visit Pat. Exhibited watercolor "Spring in Beaufort" at Sea Pines Gallery. Exhibited watercolor "Calibogue" at Sea Pines Gallery. Geneva showed her 19"x26" watercolor "Over the Garden Wall" at the inaugural exhibition of the Walter Greer Gallery of the Self Family Arts Center, Hilton Head Island. Exhibited watercolor "Basket of Violets" at Sea Pines Gallery. Exhibited watercolors "Coligny Fountain" and "Morning Mist" at the Fraser Gallery, Sea Pines SCA Building. Exhibited watercolor "Kuhlmann's Patio" at Sea Pines Gallery. Exhibited watercolor "Favorite Things" at Sea Pines Gallery. Exhibited watercolor "Still Life (Hydrangeas)" at Sea Pines Gallery. 15th annual benefit on Hilton Head Island. At the Hyatt Regency, Palmetto Dunes. Geneva contributed her painting "Beaufort Remembrance". Program comment, "Watercolors provide the substance for her joy in painting although other media have lent variety. Her painting history goes from coast to coast and abroad, with career highlights in St. Louis, MO. She has exhibited in numerous shows and has won many awards and commissions. Geneva is presently showing with the Hilton Head Art League Gallery." Exhibited watercolor "Colgny Fountain" at Sea Pines Gallery. Exhibited watercolors "Garden Spot" and "Beach, Eleuthera" at the Fraser Gallery, Sea Pines SCA Building. Exhibited watercolor "Cloister Patio" at Sea Pines Gallery. Exhibited watercolor "Lunch Break" at Sea Pines Gallery. Exhibited watercolors "Garden Spot" an "The Gate" at Sea Pines Gallery. Exhibited abstract collage "Beach Scene" at the Fraser Gallery, Sea Pines SCA Building. Exhibited watercolor "The Store, Bluffton" at Sea Pines Gallery. Exhibited watercolor "Moonstruck" at Sea Pines Gallery. Exhibited watercolors "Blooming" (sold during show) and "Morning Mist" at Sea Pines Gallery. Exhibited watercolor "Harbour, Tangier" at Sea Pines Gallery. Exhibited watercolor "Blue Vase & Veggies" at Sea Pines Gallery. Flew in to take a cruise across the Atlantic to the Canary Islands, Casablanca (saw Malcom Forbes's estate and museum with many of his Fabergé eggs), Cadiz and finally Lisbon. Had a top floor hotel room there with a large balcony overlooking the city that made room service dining irrestible. Took a local train up the coast along the beach for some independent sightseeing. Flying home, stopped off to visit Pat in NYC for a few days. Exhibited watercolor "Isola Pescatori" at Sea Pines Gallery. Exhibited watercolor "Tra La" at Sea Pines Gallery. Exhibited watercolor "California Mission" at the Fraser Gallery, Sea Pines SCA Building. annual benefit on Hilton Head Island. Geneva contributed her painting "" Purchaser: Jim Ferguson. Presented by the Hilton Head Art League at the Ball Room of the Port Royal Club. Preview party Saturday, Champagne Brunch and Show Sunday; program does not give year but 1992 seems likeliest. Flower arrangers worked to coordinate with paintings; pianists provided music. 12th annual benefit on Hilton Head Island. At the Hyatt Regency, Palmetto Dunes. Geneva contributed her painting "Transcendence" with the program note, "Since the dawn of history, art has played an immensely important part in mankind's existence; the cave people left enduring impressions on their walls. The arts lend meaning and communication. This artist has spent half a century in pursuit of skill and understanding." Four nights and a show in Vegas, playing at several casinos. Went on to stay a week at the Hootmans' Keystone condo, touring in a rented Cadillac Seville. Next, St. Louis, visiting the Hootmans who supplied tickets for the PGA tournament. Saw Ron, Vera Bennett, and Don played golf at Westboro. At the Hilton Head Art League. Geneva's watercolor "Riva del Garda" was in the show. Jurors: Kristy Deetz and Patrick McCay. Flew to SF (with Pat, using her air miles for all three) to enjoy the city for a few days, then rented a car to spend Christmas with widowed friend Betty Prior in the Del Monte Forest. 11th annual benefit on Hilton Head Island. At the Hyatt Regency, Palmetto Dunes. Geneva contributed her painting "Divertissement" Purchasers: Mr. & Mrs. Carlos Evans. At the Hilton Head Art League. Geneva's watercolor "Curb Service" was in the show. Jurors: Mary Whisonant and Roger L. Steele. Gatsby-themed preview party Saturday, with dinner and dance music, displaying 36 works of art interpreted by as many flower arrangements. Presented by the Hilton Head Art League at the Ball Room of the Port Royal Club. Played in the Regional with the DeVeaux's and helped them won some gold points, wrote Don. Played in other tournaments this year, no details. Ninth annual benefit on Hilton Head Island. Geneva contributed her painting "Zymurgy" with the comment, "I broke away frmo a representational style again. Zymurgy, it's the last word!" Purchaser: C.H. Lambrecht. Traveling with Pat who was living in Milan and did the driving in her Mercedes. Anniversary on Isola dei Pescatori, Lago Maggiore. Stops in Bergamo, Venice, Florence, Gubbio, Monte Vibbiano and more. Presented by the Hilton Head Art League at the Ball Room of the Port Royal Club. Solo Show, "There and Here, Then and Now"
Presented by the Hilton Head Art League at the Ball Room of the Port Royal Club. Preview party Saturday, presenting 35 works of art interpreted by as many flower arrangements. Four-course Broadway Musical dinner at the Overlook restaurant. Champagne Brunch Sunday with jazz entertainment. Don wrote, "Flew to Eleuthera to spend a week with Betty and Conway who were back there for the winter. Swam, boated and watched Conway retrieve several lobsters from his traps and had a great time." Pat had moved to Milan, Italy and wasn't getting home for the holidays. G and Don met friends Betty and Stan Prior in Reno for some gambling and other fun. First to the Hootmans. Pat flew in on the 6th and all stayed at a Holiday Inn while having visits with Geneva's sister Dorothy and with Ron and Mel. G and Don stopped off to see her Aunt Edna in SE MO on the way home. Last two nights were in Okeechobee visiting the Kuhlmanns. Stayed at the Hilton for this tournament over Geneva's 71st birthday. One of a number of Sectional tourneys in the SE that G & Don played in this year. Went to the Myrtle Beach tournament with Bill and Jeanne Haigh, and spent a night at their home near Charleston. Achieved Life Master status. Then the Priors came for gambling and bridge until New Year. First to Ron's in O'Fallon, then to Hootmans and Hanselmans. Saw Don's sister Velma, Geneva's sister Dorothy and her husband Orville. Trip was over Don's 69th birthday. Annual benefit on Hilton Head Island. G and Don won the last gold points they needed. Spent the last three nights in Okeechobee to visit the Kuhlmanns. Looking for details. G left the evening of Don's 68th birthday for a week. The townhouse in South Beach was great when they wanted to travel, but it lacked a good studio space (and a fireplace, which G also missed). When 51 Deer Run Lane was on the market, the owner (Art Holstein) was insistent on selling it - with his wonderful studio - to G. The Holsteins moved to the historic Edgar Fripp House (Tidalholm) in Beaufort that was used in "The Great Santini" and "The Big Chill" - and Hilda invited us to come see it. Great friends Betty and Stan Prior joined them at the Sahara for the last five days of this trip, to enjoy gambling and seeing shows together. Saw Ron in O'Fallon for his birthday, visited with Hootmans in St. Louis, Hanselmans in Edwardsville. Geneva got to visit her great friends Betty White and Bib Gould from Riverview days, and both G and Don visited with G's sister Dorothy. A ten-day tournament! Joined by friends the Priors to gamble some. On return from Paris, stopped in NYC to stay with Pat. An add-on ($1000) to the air passes, trip with hotel and 3 sightseeing tours. A colder and wetter spring than anticipated; no plein air painting, but some photographs to paint from later. Geneva's Aunt Edna visited from the 1st to the 9th, and on the 9th they took her to Savannah airport and boarded their own flight to Gatlinburg. Don & G bought air passes from Eastern Airlines which allowed trips every two weeks for a year ($1200 each). This was the first trip with those passes. While in CA, went to visit the Hoffmans at their home in Pasadena. Won their first duplicate bridge gold points in a team game, which stoked their enthusiasm. Went to several more tournaments during the year. annual benefit on Hilton Head Island. Geneva contributed her painting "". Purchaser: William Crowley. Two weeks cruising the islands plus a 6-day land tour. Met Chuck and Nancy Hoffman on this trip, who remained friends and visited in Hilton Head. annual benefit on Hilton Head Island. Geneva contributed her painting "Fine Feathered Friend" Purchaser: William Hodde. Annual benefit on Hilton Head Island. Geneva contributed her painting "Hibiscus". Purchasers: Bill and Paula Bethea. Helping out the company after retirement, Don attended a broker management seminar at Greenbriar; beautiful setting and ambiance for G to enjoy. After 3 days, drove up to NY to visit Pat, enjoying the scenic drive. Saw Amadeus and some off-Broadway shows, and once again Pat invited friends to visit with G & Don at her apartment. G & Don flew into Stuttgart (along with two friends) to pick up the Mercedes he had ordered, and then enjoyed a road trip, visiting Munich for Oktoberfest, the Italian Riviera (Ligure), and Switzerland. Don retired as President of Bene-Patterson Co in January. Don & G sold their St. Louis house and moved to their property in Sea Pines on Hilton Head. Don's farewell to some of his principal accounts, at the annual food broker convention. Saw Cats, enjoyed dining out, spent an evening at Pat's to meet her friends. Prize winner for copper enamel "Across the Bay"
Four-day trip won from Green Giant. A bonus trip won from J.M. Smucker, made with the Hootmans, wound up on G & Don's 40th anniversary, so they stayed over two more days to celebrate. Don notes the trip was non-stop from St. Louis to Maui, where they stayed in an oceanfront hotel with a golf course, which Geneva played with Don - golf having become a rare activity for G. Invited to dinner by a former sales manager for Green Giant. Geneva's copper on enamel "Egret" was in the show. St. Louis County Department of Parks and Recreation event. Paul Marquis was the second judge. Spent a week visiting the Kuhlmanns at their island home. Six days in an oceanfront hotel, with sightseeing, from Don's business with Tom-Boy. Ten-day vacation with the Kuhlmanns, starting in San Juan and then Conway drove a rented Jeep for exploring, going to the Pacific coast. Water colors at Heritage House, 2800 Olive. Elected to the Board of Governors, St. Louis Artists' Guild. Was on the board from 1978 to 1981. Chairman, Book of Hours, 1979-1980. Statewide Eighth District Federation of Women's Clubs. Bonus trip from IGA and Wetterau. Enjoyed a trip to Santa Catalina Island for a dinner dance with Les Brown's Orchestra. The St. Louis Artists' Guild Annual Festival, Super Artists in Action, at the Guild in Webster Groves. Week-long bonus trip from General Grocer. Geneva's single entry of enamel on copper "Minor Prophets" was accepted into the show. Spent a week with the Kuhlmanns at their home. Water colors and acrylics at Heritage House, 2800 Olive. Prize winner for copper enamel "Heavenly Streaker"
Crafts : Objects Exhibit, 1976-1977, in the Artists' Guild Galleries May 29-Jun 15. Geneva won the Lopata Prize. 103 items submitted, 94 accepted, 6 prizes. St. Louis Artists' Guild, 227 E. Lockwood Ave., Webster Groves. 6-day bonus trip from Tom-Boy Stores. Letter from Lillian (Mrs. Edward) Renshaw informing of unanimous decision and the next meeting, at the home of Olive Chaffee, 6107 Westminster. 9-day trip that Don won from General Grocer Co.
What is art, what is beauty? Salad Bowl, 3949 Lindell Blvd. Geneva's entry of enamel on copper "Creation" was accepted into the show. Added vacation days to Don's conference. Temps, surprisingly, were in the 80s. Planned the Win Jones watercolor workshop for Guild members, held July 19-23. St. Louis Artists' Guild. St. Louis Artists' Guild members Shirley Clearly Bentley, Hazel Goetsch, Myrtle Kornblum, Donothy Kuni and Geneva Patterson showed paintings, enamels and drawings at the Guild, 227 E. Lockwood. Served on the Membership and Program Committees. Honorable Mention for "Children among Trees"
In competition at the Prudential Savings &s Loan Show, The Society of Independent Artists of St. Louis, sometime during the presidency of Eleanor Zacher, who left the certificate undated. .
Don's convention took them to SF's Mark Hopkins Hotel. Every California trip was a chance to meet up with Betty & Stan Prior and do some gambling, so they met at the MGM Grand Hotel and Casino where they also enjoyed a couple of shows. A food broker convention took Don & G to Waikiki Beach. They later flew to Maui and the big island of Hawaii, staying at Mauna Kai Resort, run by Rockefeller Corp. All American plan and expensive, said Don, but they enjoyed themselves. Added on vacation days at the beach hotel after a conference of Don's. Rether a working vacation, taking care of their villa which was on Sea Pines's rental program. After Don's convention in Waikiki, went to Maui, then stayed at the American-plan Mauna Kai Resort on Hawaii. Don had a management seminar, to which they added vacation days at their beachfront hotel.
" in recognition of your creative accomplishments"
Drove to Myrtle Beach, Charleston and Hilton Head; and bought a home in Sea Pines. Met up with the Kuhlmanns as he had just retired. Loved the area, food, pool and golf. Checked out a community of retired Americans but didn't see the appeal. Both of Geneva's entries were accepted into the show, and both were watercolors: "Once a Palace" and "Children among the Trees." Geneva Patterson, Enamels, Dianne Claassen, Acrylics, at The Ark Gallery, 51 N. Gore. Added some vacation days after Don attended a management seminar. After Nassau they flew over to Eleuthera to explore the island for a couple of days. In competition at the South County Center Show, The Society of Independent Artists of St. Louis. Honorable Mention for "Portrait of a Young Man"
In competition at the Early Winter Show, The Society of Independent Artists of St. Louis. Honorable Mention for "The Waiting Game"
In competition at the Clayton House Show, The Society of Independent Artists of St. Louis. Just have her entry card on which someon noted "Winner." Entries were oil and wax "Facade" and copper enamel "Floral Abstraction." Honorable Mention for "Floral #1"
In competition at the South County Mall Show, The Society of Independent Artists of St. Louis. Stayed on the 50th floor of the Americana, saw a Broadway show and the Johnny Carson show in the RCA building. Met up with friends Jen &l Wanda Jennings and Betty and Conway Kuhlmann, to go to a nightclub. Honorable Mention for "Mexican Sabbath"
In competition at the Medal Award Show, The Society of Independent Artists of St. Louis. In competition at the Projections in Art Show, The Society of Independent Artists of St. Louis, hanging at South County, sometime during the presidency of Virginia Bergfeld, who left the certificate undated. Food brokers' annual convention was again in NYC, at the Americana. Always enjoyed restaurants and Broadway shows with friends, and brought back nice Christmas gifts! Food brokers' convention in NYC, at the Americana. Always enjoyed restaurants and Broadway shows with friends, and brought back nice Christmas gifts! Presented by Northside Art Association. Led to buying a lakefront vacation home on the Tan-Tar-A road, in October. Hi-C trip. Started with 3 vacation nights at Las Brisas, Acapulco. In competition at the Northland Show, The Society of Independent Artists of St. Louis. In competition at the No-Jury Show, The Society of Independent Artists of St. Louis. The Society of Independent Artists of St. Louis. Honorable Mention for "Old Court House"
Haven't found the date that Geneva joined RKR, but can see that her membership dates at least from 1965. Food broker's convention was held every other year in NYC, at the Americana. Always enjoyed restaurants and Broadway shows with friends, and brought back nice Christmas gifts! NY-Southampton on the SS France as the start of a 9-country tour, returning from Paris. G was planning to go to Europe with a friend ca 1938-1939 but Don convinced her to forego travel and marry. The friend she would have gone with met her future husband on the ship home! At long last, Geneva got to Europe (with Don and Pat) - just the first of many visits to come, all obviously quite inspiring for her art. 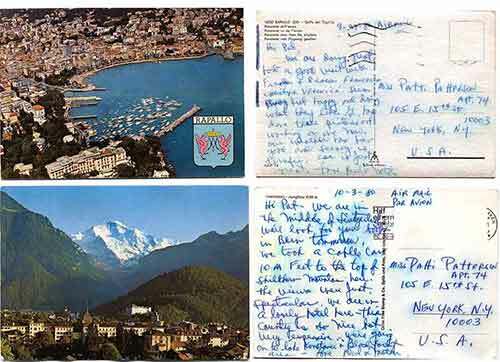 Don's list of their travels misses something out here, as Don & G were on a 5- to 8-day business trip of his when President Kennedy was assassinated. One of five noted local artists exhibiting in the Cinema Theatre, Grandview Shopping Center. Prize winner for watercolor "La Recherche"
In competition at the Modern Show, The Society of Independent Artists of St. Louis. At the annual No-Jury Show, Society of Independent Artists of St. Louis, Kiel Auditorium Refectory. In competition at the Art Museum Show, The Society of Independent Artists of St. Louis. Part business for Don with Dole Pineapple and Mauna Loa macadamia nuts. Vacation 2 nights on Kauai, 3 nights in Kona with a company car supplied in Hilo. In competition at the Spring Petit Pigalle Show, The Society of Independent Artists of St. Louis. Prize winner for "Christo Chapel"
Bought a ski boat, kept at Alton Lake, used it on jaunts up the Mississippi but also trailered it for skiing on Lake of the Ozarks, Kentucky Lake and near Hot Springs, Arkansas. Bicentennial Art Fair, sponsored by the Society of Independent Artists and Northland Shopping Center. More than 160 entrants, more than 600 items. Started as business, but allowed G to visit her father and his wife before going on to Las Vegas. Honorable Mention for "View from Memorial Plaza"
Sponsored by the Society of Independent Artists. Mrs. Emil Lind, chairman, with Mrs. Donald Patterson, Bidwell C. Cranage and Vincent Scibetta. The invitation reads, "ABC Club, Missouri Federation of Women's Clubs, takes great pleasure in presenting Geneva Patterson, St. Louis Artist. Mrs. Patterson will draw a sketch of one of the members in the audience chosen by lot. Some of Mrs. Patterson's works will also be on display. 1 pm at the home of Mrs. Walter J. Hunt, 601 Acorn Dr., Crestwood. Co-hostess: Lois (Mrs. Marshall B.) Conrad. In competition at the Late Winter Show, The Society of Independent Artists of St. Louis. "included in her exhibit several paintings made on her recent trip to Puerto Rico"
Three-week road trip enjoying Don's new, air-conditioned Oldsmobile 88. Drove Route 66 out to California, visiting parks in New Mexico and Arizona. Went to San Diego and made a quick trip over to Tijuana. Had a great time in Disneyland with two nights at its hotel. Visited G's father and went to Knotts Berry Farm. Up California to visit the Priors living in Del Monte Forest on the 17-Mile-Drive, then to their cabin in Kibirz on a fork of the American River near Lake Tahoe. Drove home via Salt Lake City and Bryce Canyon, Estes Park and Colorado Springs. including works loaned by Mr.& Mrs.: J. Pape, O. Waters, C. Catanzaro, R. Ryan, J. Scibetta, V, Childress. Two works were purchased by Hahne, one by Mrs. Walter Hunt; other sales without names. Honorable Mention for "Tulips by Pond"
In competition at the annual No-Jury Show, The Society of Independent Artists of St. Louis. Exhibition of works loaned by B. Copp Lotshaw & Will Wegener, E. St. Louis artists included Geneva's painting, "Christ Church Cathedral," owned by B. Copp Lotshaw. In competition at the Petit Pigalle Show, The Society of Independent Artists of St. Louis. G took Pat with her for the 2-week trip led by Jim Harmon. Afterwards, Don and Ron joined them for a week's vacation. Flew on 707s, which TWA had just recently put into service. Prize winner for "Monterey Wharf"
Went with friends Bill and Audrey Hearst to visit Betty and Conway Kuhlmann. Bill piloted the group in a rented Cessna. Honorable Mention for "Gulf Harbor"
Spring trip driving through the southeast to Treasure Island, Silver Springs (enjoyed the glass-bottom boats) and Cypress Gardens (enjoyed the water-skiing show). Ron and Pat enjoyed feeding the animals at the Deer Farm. Letter from Wayne L. Townsend, President, St. Louis Artists' Guild. 1st Prize for oil & casein "White Pitcher & Fruit"
New York & St. Louis, 815 Olive St.
Prize winner for watercolor, "Old Red Barn"
Newspaper mention, "...Geneva Patterson, who uses an overhanging balcony with great effect in her watercolor, 'St. Charles Scene.'" Drove down to enjoy golf and the beach for ten days, American plan. Petit Pigalle Galleries, 4207 Lindell bl. Business trip first, by train to San Jose (Sunsweet Prune and Pratt-Low Cannery), "stayed with cannery owner and wife overlooking Santa Clara Valley when it was all unspoiled and beautiful", wrote Don. On to Pacific Grove to visit the Priors and see their Grove Sportswear store. Don got poison oak, Geneva got appendicitis requiring a week in hospital, so they ended up being away four weeks - and had to wire Don's office for additional funds. Newspaper mention of G's "Betty"
"a rare study in serenity." One of six artists from the Society of Independent Artists in the September show at Town & Country, Congress Hotel cocktail lounge. G's painting mentioned in tne Globe-Democrat was "Refreshment Stand"
Drove to NY en route to Cape Cod. Then to a Cardinals game in Boston before spending 2 days at Niagara Falls. Over to Canada, and home through Detroit. By train to the canyon, then on to LA to visit G's father and new wife Siddie. Last stop, Pacific Grove, visiting the Priors. Flew to Cuba for 3 days, rest of the time enjoyed beach life in Miami. Start of their post-war extended vacation, meeting friends Betty & Stan Prior. G went out to be able to see Don before he would be shipping out. Fifteen years before the Gateway Arch was so much as a gleam in architect Eero Saarinen's eye, a St. Louis schoolgirl, asked to visualize the city of the future, drew a remarkably accurate picture of today's riverfront - complete with Arch. The extraordinarily prophetic drawing adorned a center gatefold spread covering two pages in the 1933 Central High School yearbook, "The Red and the Black." It was signed by the artist, Geneva Abbott. GENEVA, a member of that year's graduating class, made the drawing to illustrate the yearbook theme - "A Look into the Future." She showed a St. Louis riverfront cleared of all structures but the Old Cathedral and the Old Courthouse, and framed by a great arch which any St. Louisan today would unhesitatingly identify as Saarinen's masterpiece - designed in 1948. The arch in the 1933 drawing isn't just an arch. It is neither vague nor nondescript. It's the Gateway Arch as it stands today, to the life - even to the sharply triangular bases and leg conformation. A further coincidence is that the drawing was made in the spring of 1933. It was in April, 1933, that the late Luther Ely Smith Sr. first publicly proposed that a riverfront development of some kind be launched - but 15 years before Eero Saarinen hit on the prize-winning idea of a stainless steel catenary arch as the central motif. The 35-year-old yearbook was brought to the attention of the Globe-Democrat by another member of the class of '33, Mrs. William F. Koehler, 11056 Ayrshire dr., Maryland Heights, the former Miss Auralia Caran. Mrs. Koehler notes that a fellow student was David Margulois, who left St. Louis to become famous in the theatrical world as the producer-actor David Merrick. Winners of the winter show, now on display at Kiel Auditorium, were announced yesterday. Geneva Patterson for "Bosun's Locker." Fred Carpenter won second prize with his work entitled "Two of Us", and third prize went to Esther S. Reed for "Winter." The contest was judged by members of the organization. The exhibit includes 60 painting from 55 artists in the St. Louis area. The paintings included oil and water colors, representational and modern styles. The show will continue through Feb. 23. Geneva Patterson, whose recent watercolors are currently on display at St. Luke's Hospital West is a painter and enamelist. Her activities in the St. Louis art scene have included Chairman of the Art Section of the St. Louis Artists' Guild and a former Board member, Past President of the Independent Artists of St. Louis, a member of the exclusive St. Louis Women Artists and the R.K.R. Club. She is represented in international, private and business collections and is the winner of numerous exhibition prizes. Art created from a woman's perspective will be featured at an upcoming exhibit at The Gallery Downstairs. "Intuition: Woman in Art" will include paintings, drawings, enamels and jewelry by female artists from Southern Illinois and St. Louis. The dates for the show are August 13 to September 13. Visitors will discover that each of these artists has a strong individual style. The airbrush paintings of Ann Metzger of St. Louis possess a light, airy quality. Mostly abstract in subject matter, they are executed in bold pastel hues which immediately capture the viewer's attention. More traditional in form are the portraits by Jane Pettus, also of St. Louis. Her sensitive figure studies are quite warm and full of personality. Ilah Fulton can also be considered a traditional painter, and yet she brings to her still life scenes none of the "heaviness" which is traditionally associated with oil painting. They seem to glow from within. Mrs. Fulton is from Greenup. A third St. Louis artist, Geneva Patterson, will be exhibiting a stunning and unusual collection of copper enamel work. Also featured at this time will be line drawings by Kathy Ann Taylor of Greenville, and handcrafted silver jewelry by Sue Shrode of Mt. Vernon. "Intuition" can be viewed at the Gallery, 214 North Third street, daily from 8 to 5 and on Saturday afternoons from 1 to 5. This is the final exhibition scheduled to appear at the Gallery Downstairs. For its closing exhibition of the current season, the Artists' Guild is showing works that seem to be asserting insistently, and convincingly, that women can, too, put oomph in painting. The four-woman show by Carmen Bahr Kress, Ruth Menendez, Geneva Patterson and Alice Pearcy Ulbright fills both galleries of the hall at 812 Union boulevard. It is spirited and bright, with quiet interludes here and there. The first three artists are housewives, although Mrs. Menendez formerly taughtan adult education art class at University City High School. Mrs. Ulbright teaches art at Ferguson High School. The show runs through May 30. Most of Mrs. Kress's works are in her characteristic heavily built-up paint surface style. Entering the large gallery, the visitor passes between her "Bouquet," which makes a rather massive construction project out of a vase of flowers, presenting them as bold designs in muted colors, and her "Calypso," a strident swirl of colors and textures. Prominently in view across the room is her "Holiday," a deep-textured blur of banners, buildings and marching people that calls to mind the Monet "National Holiday, Rue Montorgueil," exhibited here last fall. The Kress banners are given prominence, and the point of view is at street level. Her "Gladiolas" shows dextrous palette knife work in the development of petals on long stalks. Another commanding oil in the entranceway is Mrs. Patterson's "Circus Riders," with its performers standing on prancing horses in a vivid glare of red-orange light. Her "Abacus" treats the ancient counting device as a dramatic composition in black on white, a design as carefully considered as a Mondrian abstraction. "Parade," in watercolor, is another version of banners and marchers, this time in a fairly loose, flowing view of a broad front rank. "River Town" has buildings and water in a cool, twilight haze. "Intermission" is a small oil of a ballet dancer, seated on the floor and framing a background view of the stage door. "Merry-Go-Round" is Mrs. Ulbright's most prominent work, with its scene of brilliant lights and animated confusion under a glittering canopy. Her "Neighborhood" is a partly abstract grouping of houses, outbuildings, fences and streets, and a more formal cityscape is in "Late Afternoon", with shafts of light falling across a facade of rowhouses. The outstanding abstraction in the show is "Alone, Alone," by Mrs. Menendez, which places a white pyramidal shape in a subtly lighted vastness of deep purple. Her "Fast Track" is a watercolor snapshot of horses rounding a turn, and her "Sea Gulls" is a composition of black wingstrokes in watrcolor on very wet paper. A print show of unusual interest is the display of French and Italian graphics at the Three Arts Shop, at 6501 Delmar boulevard. The prints range from Daumier to the present, and include Roualt, Degas, Derain, Maillol, Matisse, Leger, Campigli, Chagall, Florini and others. Geneva kept a record of her works in this show, which opened on May 18, 1958. Sadly, there is no photographic record of any. Mr. and Mrs. Don Patterson and children, 10 Quinton Hill Ct., have just returned from a spring vacation in Florida. Motoring on a tour of the northern part of Florida, the Pattersons spent some time on the beach at Pensacola, at Cyprus Gardens, spent three days at Daytona Beach, and three days on Treasure Island. Ronnie and Patti, who attend Riverview Elementary School, enjoyed sightseeing along the way. The family returned April 14. Mrs. Patterson has just been re-elected first vice president of the Society of Independent Artists of St. Louis. Mr. Patterson's father, Edward Patterson, returned last week from a month's illness in the hospital. He is recuperating at the Patterson home. Prize-winners in the annual no-jury show of the St. Louis Society of Independent Artists, now current at Kiel Auditorium Refectory, are: Geneva Patterson for her watercolor, "Old Red Barn"; Charles A. Morgenthaler, oil, "Dinner Bell in the Ozarks"; Alice P. Ulbright, oil, "Horseweeds"; Virginia Moberly Schlueter, pastel, "Boat House"; Douglas Brown, watercolor, "Guitar Player"; Leona A.R. Ottofy, oil, "November"; Victor Joseph Kunz, watercolor, "Invasion". Government bonds were the prizes. Honorable mentions went to Oliver Steidemann, Ruth Menendez, Paul G. Tirmenstein, Helen Koch, Edwin B. Gustavson and Margaret R. Kirchner. A six-woman art show will open Saturday at the Petit Pigalle Galleries, 4207 Lindell bl., and will continue through the month. Participating will be Laura LeMoine, Alice Ulbright, Carmen Bahr Kress, Jane Bakelor, Geneva Patterson and Ruth Menendez. All are well-known St. Louis artists and each will have on view five examples of her work, in oils, watercolors, pastel and other media, painted especially for this exhibition. Girls attending Polaris Brownie Day Camp, in Bellefontaine Neighbors, will observe "Christmas in July" on Tuesday. The Brownies will sing carols, decorate a living tree and exchange gifts which they have made. Mrs. Geneva Patterson, a professional artist, is giving the campers lessons in charcoal sketching and tempera painting. The enamels in this section are, of course, all works of Geneva's. Thank you for the pleasure of being here today and the privilege of sharing a little knowledge of the art and craft of copper enameling. I readily admit to being not an expert, but an enthusiastic follower of this art form which has a history of over two thousand years, and has in the last few decades developed a tremendous interest in the U.S. In past centuries, enamels were thought of more as a precious stone or jewel and often used to embellish the house of God. And again today you will find many works by contemporary enamelists used as altar pieces, crosses and chalices. From the 6th century B.C. in Greece, enameling has been an art practiced on metals including gold, silver, copper and brass by all the great civilizations, and although it is older than the art of pottery, for some reason pottery is more widely understood. There are many works in our museums today that attest to the permanency and importance of enamels from all the magnificent periods in history. Each age contributed its own aesthetics and inventiveness. Limoges, in France, became famous for enamels done there in the 15th century. Cellini and Fabergé created fabulous works of unsurpassed craftsmanship. The enameling work being done today is certainly derived from the work of the past, but the experimental approach is a distinctly contemporary contribution and it is in this area that the important work of today is being done. This possibility for experimentation, the rich and pleasing color and design possibilities, has lured many artists from the paint and canvas realm to that of glass and metal. From the tiny enameled snuff-box made during the reign of Louis XIV for some Duchess of the French court, to one of our modern enameled murals covering many square feet, or a contemporary rough-textured, free-flowing, burned-edge abstraction is a long step, but this fascinating medium will no doubt remain a challenge to creative minds and pass through many more phases in centuries to come. Today it has become so popular a medium for expression that enameling has been made a part of the curriculum in many high schools and is a course offered in art schools, craft schools, universities and in evening adult education programs. While the artist-craftsman may decry the amateur's approach, yet enameling gives much satisfying experience to both the beginning dabbler and the experienced craftsman. The primary factors which make enameling pleasurable is the speed of firing time required, the appeal of color -- there are several hundred colors available from leading manufacturers -- and the simplicity of the basic technique, which can lead into an exciting area of exploration. Even those who have worked for years with this medium feel its possibilities have barely been touched, and this attests to its richness. So much for history and introduction, now let us examine the process itself. Copper enameling is basically the art of fusing glass, usually in granular form, sometimes liquid, to a copper shape. The enamel is composed of feldspar, quartz, silica, borax, lead and mineral oxides for color, all ground into fine particles. It comes in transparent, opaque and a few opalescent colors, and is applied in various ways to the article to be enameled, and then fired at a temperature of about 1500 degrees Fahrenheit. The heat causes the enamel to melt and unite with the surface of the copper. Since glass melts at a lower temperature than copper, this seemingly impossible marriage takes place. Colors in enamels, when fired, are enduring. The enamelist may fire a piece many times before completion and end with many layers of enamels one on top of the other. The finest examples appear to be within the surface rather than on top of it and create a beautiful illusion. The more times transparent colors are fired, the richer they become. The enamelist must become familiar with his medium by testing and timing, in order to reproduce a chosen color scheme as he desires it to be. The firing process is always suspenseful. Overfiring or underfiring can make decided differences in the results. Some colors are harder or softer than others, and so take differing firing times to mature. Transparents may be mixed before firing, like blending paint, but opaques do not mix and would produce a salt and pepper effect when fired. Firing transparent color over opaque gives more depth to the overall effect. They are also most beautiful fired directly over the copper. The copper piece should be enameled on both front and back, for a thick coat of enamel on the front without counter enamel on the back would crack eventually. Before it can be enameled, the copper piece is cleaned by annealing, which means it is placed on a rack and put into a 1400-degree or more heated kiln until it turns black. Removed from the kiln, it is cooled immediately in cold water and then immersed in an acid solution to remove the fire glaze. Some rubbing with steel wool may be necessary. Then rinsed and dried, it is ready for enameling, and should be handled only by the edges. First the piece is sprayed with a liquid adhesive called agar, and the enamel is sifted onto the dampened surface in an even, thin layer, sprayed again with agar and resifted at least once more. It must be dried thoroughly before firing and handled carefully. It is then placed on a firing rack, which is lifted with a fork and placed gently in the kiln heated to about 1500 degrees F -- at which temperature the heat will be a bright orange color. If too hot, the color is a golden orange or yellow. Most of the larger kilns, which are similar to ceramic kilns except with a front-opening door, come with a pyrometer which indicates the temperature. A tiny opening in the door allows the enamelist to peer into the chamber and watch the progress of the firing. When the enameled surface is smooth and shiny, rather like an orange peel, it is ready to be removed. Firing usually takes two to three minutes. The piece is removed on the rack with the fork and allowed to cool on a fireproof surface, away from drafts. As it cools from red-hot, the colors gradually appear and it is exciting to watch. Now with only one side enameled, the other must be cleaned in acid again, and the edges filed, before it is enameled. Most often two fired coats are best for good coverage of a base coat. Small pinholes in the fired enamel indicate the need for a second coat. Now with the base coat and the counter enamel fired, there are several ways to decorate the enameled surface. We'll touch briefly on the better-known of these, and illustrate these methods with a few examples of work. These examples are not outstanding works, and I would urge you to visit the Craft Alliance shop on McPherson just east of Euclid to see some really lovely and varied art objects in enamels. Or watch for enamels in exhibitions of art work and at the jewelers, Jaccards for example. There are enameled works appearing now even in the department stores, mass-produced but interesting. One simple method of creating a pattern is by use of a stencil. A paper stencil is moistened, laid on the copper or fired base coat and the enamel sifted through the stencil. Scraffito is the method of creating a soft line effect by scratching through an unfired base coat or a contrasting color over a fired base coat. Lumps and threads, an easy and fun method of adding color and detail to the enameled base coat. Lumps are solid hunks of enamel, which melt into flat circles and the threads melt into lines of various widths. These can both be varied by scrolling through them. When they have arrived at the molten stage in the kiln, a long, pointed tool is used to swirl the colors around, creating a lovely, abstract pattern. It's a bit tricky, asbestos gloves are used and the work done through a barely-opened kiln door, but the results can be most effective. Crackle colors, a commercially-prepared liquid enamel which is painted on in a solid layer, dried, and which then cracks into undetermined patterns when fired over a base coat at 1600 degrees. There are several ways of controlling the crackly effect for variations. Jewels, which are similar to lumps of enamel but which do not flatten out as much when fired, are pre-formed glass which matures at 1800 degrees. They can be made from broken colored glass in the kiln by firing, shattering and refiring until mounded. Separation enamel is an oily, black substance which is painted on the second or third coat of fired enamel and which will eat into the enamel and cause it to separate in a wide pattern when overfired, allowing the undercoat to show through. Again, thickness of application, manner and time allow production of different effects. Gold and silver leaf, or foil, are used in combination with transparent enamels for rich and beautiful results, if handled tastefully. Gold, silver and copper lusters can be applied with pen or brush. Cloissonné, a technique whereby color areas are separated by silver or copper wire bent into design shapes and fired into the enamel. Then the areas inside the wires are carefully filled with enamels and refired. This was one of the first procedures used by ancient enamelists. Designs can be applied by wet inlay, using a spatula to spread moistened enamels in a pattern, or even sprinkled on with the fingers. There are endless ways of experimenting with the many enameling products available. These are but a few of the ways to proceed. I hope to have been able to impart some understanding of this art and craft which will enable you to identify and enjoy it. As to my personal approach to enameling, learning and gaining some mastery of the various time-honored techniques and then trying a painter's approach within the limitations of the medium has been the goal. I do not seek to change, but rather, to use, the character of the enamel itself. It does not afford the greater flexibility of paint, but the richness of color, texture and design that can be achieved with enamels is a challenge and an inspiration. Not having the technical patience and skill of a true craftsmann, I prefer to not be inhibited by the established do's and don'ts of the purists in this medium. Quoting from author Kenneth Bates, author and internationally known enamelist for forty years, also a teacher and exhibitor, "The artist must know a recipe for art, and must have imagination, the one facet of the intellect without which he feels life is not worth living." So, agreeing with Mr. Bates, I have learned the recipe, and now I'm changing it by adding a pinch of this or that, and having a great time watching the results. If what comes out of the kiln leaves something to be desired, then something is added and back in it goes. Sometimes as simple a trick as firing a flat piece in a slanted position will bring a dull composition to life. See if you can find the one which had that treatment when you look at these on display later, as I hope you will do. Enameling is not a process difficult to learn, and in only a few lessons one can produce very satisfying, if simple, attractive objects. In case you are ever tempted to try it, may I warn you before you start: enameling does exercise a strange fascination, and once having started, you may never be able to give it up, and so spend a good part of your life bending over a hot kiln in a basement workroom. But we who are "hooked" think it's exciting! Donna Tuggle, Herb Amtsberg, Geneva and Don Patterson have returned from Hollywood, Fla., where they played in the Knockouts at the Seniors Regional brdige tournament. They were in the semi-finals, earning nearly six gold points, and now the Pattersons and Donna have over 25 golds, the number of golds required for the rank of Life Master. Herb made Life Master last year, needing only the required red points as he had earned reds before 1968. He is happy now that he also has over 25 golds. We will be pulling for these active bridge players to accumulate the rest of their points and become Life Masters this year! When a student at Central High (established in 1853, "Oldest High School West of the Mississippi"), Geneva was selected to create the introductory illustration for their yearbook, The Red and Black. Theme: The Future. She drew the St. Louis riverfront seen through an arch. Some 30 years later when the Gateway Arch was conceived, someone discovered that earlier rendition and the newspaper sent a reporter out to interview this "psychic artist." See the Globe-Democrat's article in the Press Clippings section of this site, below. In 2000, local TV news again raised the subject of the drawing, asking "Whatever became of Geneva Abbott?" Here on the web, you can answer the question for yourself.